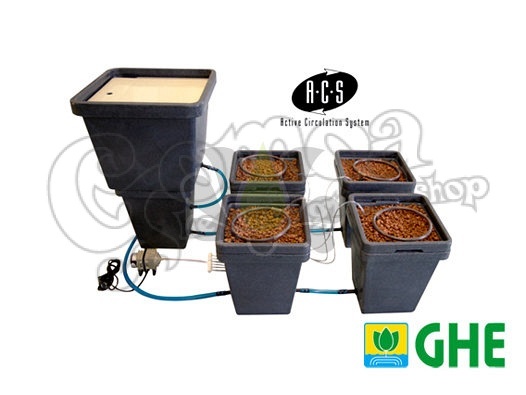 The WATERPACK « ACS » is a small hydroponic system, practical, efficient, and user-friendly. It allows you to grow your favourite pants at home, at little cost, and in relatively reduced areas. It is made of 4 WaterFarms connected to a central active reservoir called « ACS » CONTROLLER. It is an easy-to-assemble kit, ready to use in no time. It circulates the nutritive solution in the whole system in less than 1/2 an hour, and allows to rapidly homogenize the solution. It helps stabilize the pH and EC levels in all the pots at once, and guarantees the roots a constant and optimized environment. It is very practical: one small air compressor is enough to move the flow in the whole system (inside the pots and between them). You can adapt the WATERPACK « ACS » to all systems, ours as well as other manufacturers, or to the ones you build yourself, no matter how many pots you have. Tubing and connections are available too, if you wish to extend your installations. The ACS CONTROLLER is made of 2 parts: the lower tank « A » (circulation and control area), and the higher tank « B » (supply area). The active circulation in tank « A » enables direct EC and pH management. Its flap-top allows immediate access to the water supply in tank « B ». Note : The WATERPACK « ACS » is manufactured with heavy-duty, recycled plastic. It contains UV and light barriers to protect the roots from light and algae growing. Each WATERPACK-ACS comes with a free of 1L Flora Series, assembly instructions, and "The Basics", a short but detailed information booklet on nutrient and system management.